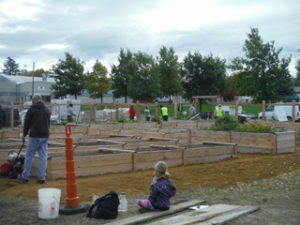 Finished the ADA-accessible paths of the Community Garden by placing and tamping 30 yards of decomposed granite. Les will tinker to further level the dg this week. In two weeks, we place 130 CY of soil, roadmix and dg. It looks great. Staked trees on all patches. Dug in drip mains in EcoOrchard A, B, C, E, and F, Berry Thicket, Culinary Patch, Grape Arbor, and Kid’s Patch. 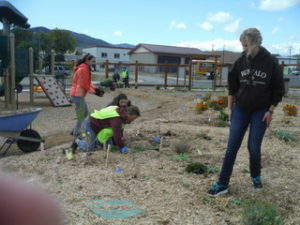 Mulched EcoOrchard A,B,C.E. and F and play access paths and landing in the Kid’s Patch. Removed grass and radish seed from all patches including the windbreak, hugelkulture berm. We fed the forest floor with radish greens. Removed plastic from solarization experiment. Also finished laying the path for ADA-accessible berry picking. All elements of our coalition were present and accounted for! Helena Parks and Recreation, Helena Foodshare, Helena Community Gardens, and Montana Conservation Corps made it possible. Thanks to the Jan Shaw Youth Home, Boy Scout Troop 219, Helena High School Community Club, Merlin, Master Gardeners, and 6th Ward and Helena Residents. Your effort was essential. And thanks for having a good time. Thanks to Karen Lane for taking the photos.